The Small and Medium Industry Valencian Institute (Impiva) and the Innovative Companies European Centre (CEEI) from Castellón, chaired by Diego Basco, awarded yesterday the prize to the Best Business Project developed in 2006 to the technological-base company Xop Física S.L., for the development of humidity sensors for the soil or as rain detectors to stop the irrigation programming. business career of Elektrosol S. L., dedicated to the study, installation and maintenance of the required technology to use solar energy in domestic and industrial processes was also recognised. Technological-base company, Xop Física, specialised in humidity sensors for the soil manufacturing, was awarded yesterday with the Best Business Project in 2006 Prize, given by the Small and Medium Valencian Industry Institute (IMPIVA) and the Innovative Companies European Centre (CEEI) of Castellón. 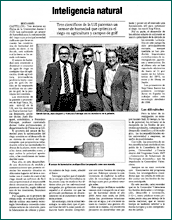 2006 CEEI-Impiva prizes, given yesterday in Castellón, also recognised the business career of Elektrosol Company, dedicated to the study, installation and maintenance of the required technology to use solar energy in domestic and industrial processes.